↑ О. Фриш, Дж. Уилер Открытие деления ядер(ռուս.) // УФН. — 1968. — Т. 96. — С. 700—707. ↑ П.С.Кудрявцев Курс истории физики. — Москва: Просвещение, 1982. — С. 73. ↑ I.R.Cameron, University of New Brunswick Nuclear fission reactors. — Canada, New Brunswick: Plenum Press, 1982. ↑ V. M. Strutinsky Shell effects in nuclear masses and deformation energies // Nuclear Physics A. — 1967. — Т. 95. — № 2. — С. 420−442. ↑ M. Brack, Jens Damgaard, A. S. Jensen, et al. Funny Hills: The Shell-Correction Approach to Nuclear Shell Effects and Its Applications to the Fission Process // Reviews of Modern Physics. — 1972. — Т. 44. — № 2. — С. 320−405. ↑ Peter Möller, Arnold J. Sierk, Takatoshi Ichikawa, et al. Heavy-element fission barriers // Physical Review C. — 2009. — Т. 79. — № 4. — С. 064304. ↑ Ulrich Brosa, Siegfried Grossmann and Andreas Müller Nuclear scission // Physics Reports. — 1990. — Т. 197. — № 4. — С. 167−262. ↑ U. Brosa, H.-H. Knitter, T.-S. Fan, et al. Systematics of fission-channel probabilities // Physical Review C. — 1999. — Т. 59. — № 2. — С. 767−775. ↑ C. Romano, Y. Danon, R. Block, et al. Fission fragment mass and energy distributions as a function of incident neutron energy measured in a lead slowing-down spectrometer // Physical Review C. — 2010. — Т. 81. — № 1. — С. 014607. ↑ Norman E. Holden and Darleane C. Hoffman Spontaneous fission half-lives for ground-state nuclide (Technical report) // Pure and Applied Chemistry. — 2000. — Т. 72. — № 8. — С. 1525−1562. ↑ E. K. Hulet Spontaneous fission in the heavy elements // Journal of Radioanalytical and Nuclear Chemistry. — 1990. — Т. 142. — № 1. — С. 79−99. ↑ V. Metag, D. Habs and H. J. Specht Spectroscopic properties of fission isomers // Physics Reports. — 1980. — Т. 65. — № 1. — С. 1−41. ↑ E.Fermi The Development of the first chain reaction pile(անգլ.) // Proceedings of the American Philosophy Society. — 1946. — В. 90. ↑ Ларин Иван Иванович Реактор Ф-1 был и остаётся первым // Наука и жизнь. —М., 2007. — В. 8. ↑ Александр Емельяненков День Сурка по-красноярски // Российская газета. — 2010. — В. 81. Камерон И. Ядерные реакторы. — Энергоатомиздат, 1987. — 320 с.
Климов А.Н. Ядерная физика и ядерные реакторы. — Энергоатомиздат, 1985. — 352 с.
André Michaudon From Alchemy to Atoms. 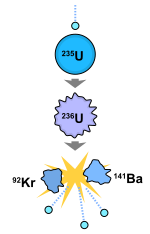 The making of plutonium(անգլ.) // Los Alamos Science. — 2000. — № 26. — С. 62—73.